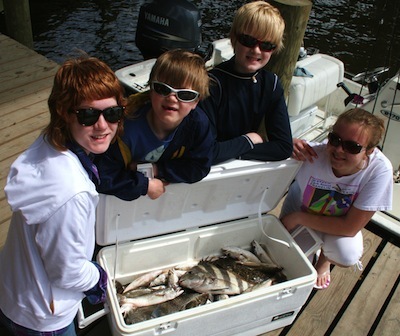 APRIL 9, 2009 - Had some great kids aboard TEAM BRODIE CHARTERS on this outing. Had a bit of calm weather, and a quick run to the reefs delivered a fast bite on the tasty white trout and ground mullet. Paige, Will, and Daniel Severson of Nashville, TN, as well as Anna Tervo of Finland simply had a blast hauling in the fast paced bite of these two delicious species. After they quickly boxed over 60 of the cooperating fish, as well as a nice flounder, well, a quick run back to the Back Bay of Biloxi had them in awe of some bigger fish. Matter a fact, young Daniel hooked, fought, landed, and then released a beautiful black drum in the 30-pound-class, and a smaller black drum and a nice sheepshead was added to the mix. Remember...speciality trips for Florida pompano and tripletail a.k.a. "blackfish" can be arranged. Although it was a short trip, merely minutes from the launch at the D'Iberville Marina had the kids enjoying some top-notch south Mississippi light tackle fun. APRIL 10, 2009 - On this trip my guests were Rich Howard and his son Nick of Illinois, and Schyler Trankler of Oran, MO. Again, a lay in the morning wind had these 3 gentlemen hauling in white trout and ground mullet, 3 really nice flounders, and Rich landed and released a black drum in the 30-pound-class. However, Nick hooked into a big fish that he fought for over 40 minutes, and had it up to boatside numerous times before the line broke. To our suprise, the fish was a huge jack crevalle easily in the 35-pound range, a large older fish with a long scar near its tail. Although the big fish would have been safely released, a picture of the big specimen would have been nice. The gentlemen followed me back home where I cleaned them the 3 flounders and a mess of white trout and ground mullet. In all, two nice half-a-day trips with great people, and plenty of fish catching action. With all of this rain, wind, and murky waters I've still been able to catch my clients plenty of fish, and soon as this weather settles look for our catches to be bigger and more diverse. So book your trip now aboard TEAM BRODIE CHARTERS, and create fantastic fishing memories of your own. Photography Portfolio: go to flickr.com and type in teambrodiecharters in the search box for over 1000 of my fishing and duck hunting photos.